Good news for scribblers everywhere! Kirsten Camara, a student at the Minnesota College of Art and Design (MCAD), designed and built an amazing Analog Memory Desk to capture her every note and doodle. 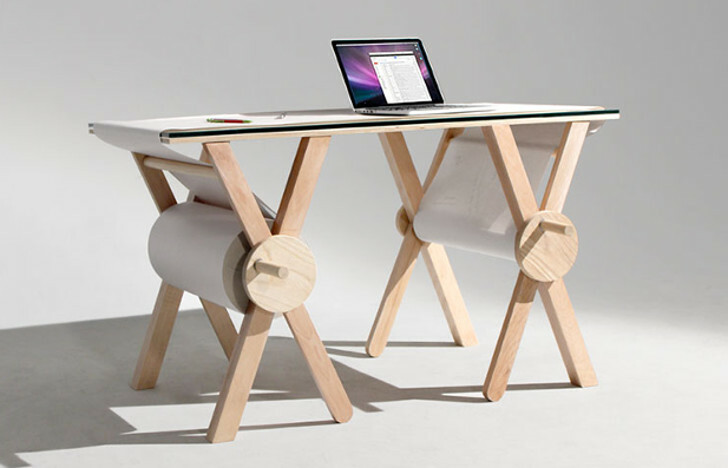 The desk features a built-in spool of paper measuring 1,100 feet long, which covers the desktop. Once you’ve filled up the work surface with your jotted notes and idea sketches, you simply turn the crank at one end of the desk, spooling the used paper off the desktop and providing a fresh canvas for all your scribbling needs. Camara isn’t building the desks for sale, but she’s released her designs for free under Creative Commons, so anyone handy with some lumber can make their own analog memory desk at home.